A Meat Grinder is a basic kitchen necessity for every meat lover. But as much as these machines are important, it is an undeniably befuddling task to pick any single one of them. What works best is to cream off the finest possible options and then pick the one that fully fits your requirements, but that exactly is the part which people find to be the hardest. That’s where we come in because we have already done it for you. After a strenuous session of some really in-depth research, we are presenting you the best meat grinders of 2018. 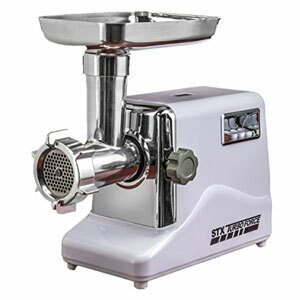 If your need calls for a powerful meat grinder for your household that is sturdy enough to endure the day to day heavy use while grinding big batches of meat, then you will not find anything better than the STX-3000-TF Turboforce Grinder. The Sunmile SM-G73 with its adequately powerful motor of 1000 watts is a perfect option for you if you need a moderately to low priced heavy duty machine that has a good output yield. 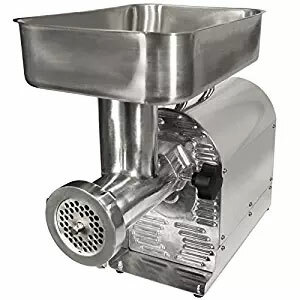 For those of you, who are finding an all in one machine with a commercial grade power at an affordable price that cannot only mince the meat but offers a variety of uses, then you have got to try the Best Choice Products Meat Grinder. 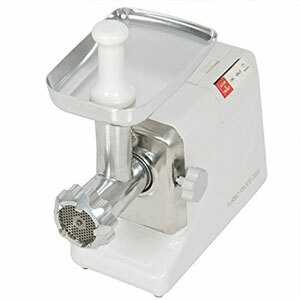 If you are seeking a highly durable professional grade meat grinder for either commercial or domestic use that can produce huge output quantities then definitely go for Weston No. 12. 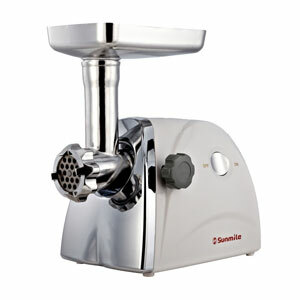 The Sunmile SM-G31 is for all of you who want a quality meat grinder without robbing yourself of your savings. This machine is powerful, durable, and grinds large quantities of meat while staying within your budget. Starting off the list with the star meat grinder “The STX-3000 Turboforce” that is unanimously popular among all the meat mincers for its functionality and high performance. With a motor power of 3000 watts and three different speeds for grinding, the STX-3000 TF has been a solid hit due to the deliverance of extremely high power for mincing your meat to perfection. This machine is for all of you who have a frequent use of mincer in your kitchen as it efficiently takes charge of all of your meat mincing requirements. You will definitely love the accessories that arrive with the machine as they not only let you mince your meat but you can also make kubbes and sausages at your home with them. The thickness of the output for the minced meat of this size no. 12 grinder is 2.5 inches, and the thickness of the feed tube is 2 inches. In case you find yourself lost in the beginning about how to operate this machine, you can simply refer to the manual for effortlessly setting it up and operating it. The three speeds as we mentioned above can be used for different purposes as per your requirement. The low speed is used for making sausages, and the high speed is used for mincing. One thing that we really like about this machine is that it allows you to grind bigger batches of meat in no time. So, it saves a lot of your time as well. The blades and other components of the machine are advised to be washed only by hands. So, do not make the mistake of putting them in the dishwasher and once you have washed them, use a towel to dry them for avoiding any discoloration. The machine comes with a three years warranty and 30 days replacement or money back guarantee, from the date of purchase, in case it turns out faulty. All in all, the STX-3000Turboforce is an outstanding choice for meat grinding, and it won’t disappoint you in any way. 30 days money back or replacement guarantee. A highly powerful motor of 3000 watts. Accessories include grinding plates, sausage tubes, and kubbe attachment. Circuit breaker for motor protection. The durable steel construction of blades. Another impressively powerful meat grinding machine for domestic use is the SunmileSM-G73. This machine features a strong motor that has a maximum wattage of 1000W that makes your mincing job less time-consuming. The usage of this meat grinder is quite simple with its big operation button. The grinder comes with an aluminum tray that has plenty of capacity to carry huge amounts of meat for making the process even more convenient. This is a highly premium machine that is extremely durable and reliable for easily meeting all of your meat mincing requirements. The attachments that come with the machine include three plates and a blade for cutting, sausage add-ons of three sorts and a food pusher with plastic construction. The plates and the blade are pretty easy to wash being dishwasher friendly. However, the aluminum components of the grinder are not to be washed in a dishwasher and should be dried right away after washing, or they may get stained. The machine has the ability to mince 50-100 lbs. of meat portions at a time without facing the overload issue, and in 60 minutes it can yield up to 185lbs. In addition to meat, the machine also lets you grind nuts in larger quantities without any issue. This grinding machine also features a circuit breaker that stops the motor from burning out. However, it is still advisable to keep giving the machine some time to cool off after every 20 minutes of continuous usage. This meat grinding machine also boasts a low noise function, a safety switch and can be run reverse as well. The machine offers a 1-year warranty for making your investment secure. Powerful motor with 600 Watts rated power and 1000 Watts maximum power. Circuit breaker to stop motor burnout. Includes attachments for making sausages and kubbes and a food pusher constructed of plastic. The manual isn’t that descriptive. Plastic components are not durable. Another great mincing machine for home use with a massive wattage is the Best Choice Products, Meat Grinder. The machine boasts 2000 watts of power, making it four times stronger than any other meat grinding machine in the vicinity of its price. At a price of around $75, this meat grinder is something that can easily fit into almost everybody’s budget. You won’t believe how effective and rapid your grinding is going to be in such a nominal investment. You can grind up to 3 lbs. of meat in one minute time. There are three-speed settings featured on the machine,which include the low, high and reverse options. The best thing about this machine is that apart from grinding meat; it can even grind veggies, soft bones and bigger pieces of meat, which makes it too good for its price. Like the majority of the machines on our list, this one is also made of durable stainless steel material. This machine features one of the biggest plates for cutting in the whole market, which result in higher yield. While the machine stands out from most of the others due to its high functionality, the safety aspect of the machine is not that impressive and chances for unintended injuries is there, so you have to be careful with it. The additional attachments of the machine include a kubbe fitting and three plates for cutting. However, it doesn’t come with sausage funnels. The warranty period of this machine is one year that lets you replace the faulty parts for new ones. With all of its features combined, this is a great value machine that will make your kitchen work more fun. Comes with a kubbe fitting and food pusher. Features very sharp stainless steel blades. A multi-purpose machine that grinds meat and veggies both. Huge steel blades for cutting. Doesn’t include a circuit breaker. Safety features are not advanced enough. 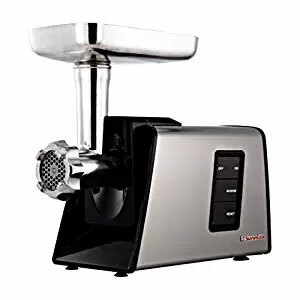 We understand that not all of you want a grinder for domestic use that’s why we have included this professional grade meat grinder in our list as well that goes by the name Weston No. 12. This grinder is especially useful for you if you are into fast food business as it makes excellent sausages and minced meat that you can use for various purposes. The grinder comes with 4 different sizes of sausage funnels that include 10mm, 20mm, 30mm and 40mm sizes. You can also use it for domestic purposes if you want excellent and fast results and aren’t reluctant to pay a little extra for all this functionality. The high-grade accessories of the machine don’t let the meat get stuck or the machine to get overheated due to heavy use. Apart from sausages and mince, you can also make snack sticks with this machine. The one major downside to this machine is that it is pretty heavy and cannot be moved around freely like the other machines designed for home use. But, that’s a small price to pay if you consider the performance of the machine. The machine has a durable stainless steel construction and cleaning it is a very easy task. The machine has a huge capacity and can grind up to 9 lbs. of meat in a minute and 540 lbs. in an hour. Not a single component of the machine has a compromised quality as all of them are made of metal and have a greasy and shiny finish on them that not only protects the machine but also makes its life longer. The rubber feet on the machine make it steady, and the circuit breaker makes it safe from burning out. The machine comes with a 2-year warranty that protects you against any malfunctions or flaws. Doesn’t come with reverse function. The last one is again from Sunmile with an extremely affordable price tag and high functionality. With its durable construction and sufficiently powerful motor, the Sunmile SM-G31 is a great choice for every household. The hopper of the machine is made of durable die-cast metal that allows you to mince larger quantities of meat in a single go without making the machine overheated. The metallic grinder head is pretty durable, and the overall machine construction is sturdy enough to last for the years to come. With such a robust assembly, this machine is surely going to make meat mincing a fun job for you. The square tray of the machine is big enough to carry large amounts of meat for making the usage more convenient. With a rated power of 250 Watts and the peak power of 800 Watts, the machine can yield about 150 pounds of mince in an hour. However, you should not put too much meat all at once as you may face some jamming and slow processing. Therefore, it is always best to keep a balanced amount. The fittings of the grinder encompass a stainless steel blade for cutting, sausage funnels of 3 types, a food pusher and 3 stainless steel cutting plates.The operating part is quite easy as you have a simple on/off button for that. You can easily wash the machine from your hands, but the blades and plates can be washed in a dishwasher as well. It also comes with a 1-year warranty, making your purchase a secure bet. Powerful motor with a maximum wattage of 800 Watts. Meat tray with huge capacity. Yields up to 150 pounds of mince per hour. Ideal and secure for home use. Grinds meat in different textures. Comes with a blade & 3 cutting plates made of stainless steel, three sausage funnels, and a food pusher. Large quantities may result in jamming. The meat doesn’t get pushed out very easily. While searching for the best meat grinder tailored to your needs, you have to take into consideration a few things that will enormously help you with your selection procedure. You want this machine for grinding the meat, so obviously, the first deciding factor is the meat quantity that you usually have to grind on an everyday basis. If you have to grind huge quantities of meat, then you will have to buy a more durable and sturdy grinder that can take some load like the STX-3000 TF above or the Weston No. 12. On the other hand, if your usage requires you to grind smaller quantities then you can go for grinders that have less powerful motors and are inexpensive as well. Meat grinders have either metallic or plastic construction. The metallic construction makes them more durable, and plastic ones are those that are neither durable nor expensive. So, here it’s all up to you to choose as per your liking. For heavy usage, we’d suggest you go for a more durable one made of stainless steel. But, if your usage is light then a plastic one will also do. However, it is always best to go for durable ones as they are built to last. The prices of the grinders vary according to the brand, performance, and features. The price range will have to be decided by you in the very beginning. That way, you’ll be able to narrow down the best available options that are within your budget. And if some additional features catch your eye during the selection procedure, you can always alter your budget as per your convenience. But, whatever you choose, make sure it has value for the money you are paying. Although a lot of people are aware of this but in case you don’t know, the stainless steel plates cost more than the carbon steel ones, but they are sturdier and sharper as well so they justify their price. Another advantage of stainless steel blades & plates is that they are not prone to rusting, unlike the carbon steel that you will need to take special care of. Therefore, we’d advise you to go for the stainless steel ones because if you have a frequent use for a meat grinder, it will be a huge pain to oil your carbon steel blades after every single use. It is good to select this machine on the basis of its meat grinding abilities, but you should always give preference to a multipurpose machine as it will make your kitchen work a lot easier. The upkeep of the machine is mandatory whether it’s an expensive one or an inexpensive one. But, if you can’t spare too much time for the maintenance of your meat grinder, then select the one that requires low maintenance, such as dishwasher safe, easy to clean, easy to assemble and disassemble, etc. On the other hand, if you don’t mind spending a bit more time in the upkeep of your meat grinder, you can choose whichever you want as per your preference. But either way, don’t forget to clean it on a regular basis. For all of you who know how to cook, you must be aware of the significance of meat grinder in your kitchen as it comes in handy from time to time. While you may come across multiple choices to select from, always remember, the best meat grinder is the one that fits your requirements completely and which you deem to be the most functional. Therefore, never get intimidated or distracted by the bigger or expensive models as there will always be something above the one that you have selected. So, just keep your focus on what you exactly need and taking the decision will automatically become a doddle for you.